I am setting up a GATK pipeline for analysis of trio. 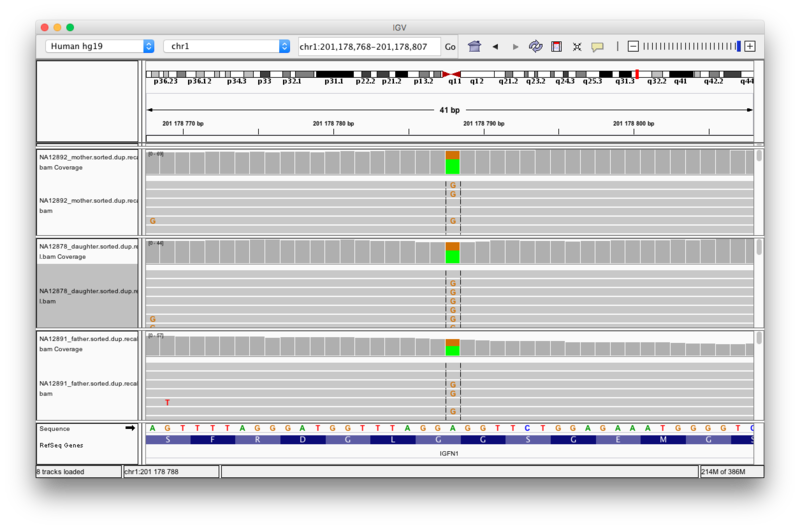 I have run all the step perfectly up to HaplotypeCaller, then GenotypeGVCFs, and finally PhaseByTransmission walkers. However, by manually checking a few variants, I am puzzled by the fact that there are variant bases in the three family members, but only the father sees its variants called. On the attached screenshot, we can see the variants (41/23 for the mother, 22/15 for the daughter, 22/18 for the father). I know that between tools, I should not expect perfect overlap on the depth of each allele, and for me it is close enough for the father (IGV: 22/18, HC: 21/13). However the mother and the daughter look like they are 49/0 and 28/0 (for IGV, they are 41/23 and 22/15). Could it be that reads supporting the alt allele have bad qualities (to the point of having 0 alt in the end)? Have a look at this document for some troubleshooting tips. Thank you Sheila for your answer! 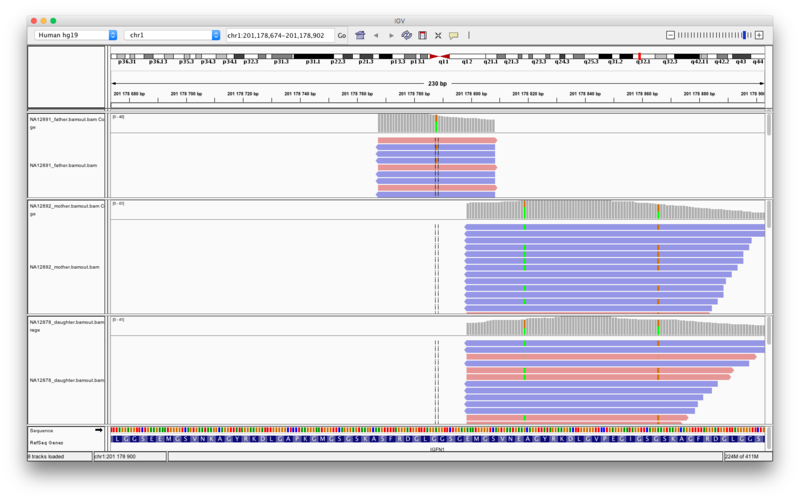 So I did run HaplotypeCaller with the bamout option (restricted to a region of 4kb around the variant), and imported the 3 bamouts in IGV. And I got the same ref/alt for the father that I saw in the g.vcf file. Nothing for the mother and the daughter anymore, but I guess the reads are removed because they bring nothing to the caller, therefore, not saved in the bamout.